The guiding principle to the preservation of a free and open internet is “Net Neutrality”. It means that ISP’s may not discriminate between different kinds of content and applications online. It guarantees a level playing field for all websites and internet technologies. The question arises as to how we should apply the concept of “Net Neutrality” in the context of Pakistan. Net Neutrality has primarily garnered a lot of attention in the United States, and has been the subject of intense scrutiny and various lawsuits over the last 4 years or so. My focus is to make it relevant in the context of Pakistan and how can it affect us in the longer scheme of things. In Pakistan, many would argue the concepts very mention would be nonsensical and idiotic. Our telecom and internet sector is predominantly dominated by PTCL; one of the largest providers of fixed line telephone, broadband and wireless internet services. Besides being in the business of providing the aforementioned services, PTCL is also involved in leasing bandwidth to all major ISP’s operating in Pakistan. Majority of the submarine cables landing in Pakistan, are owned by a consortium of telecom companies including PTCL which is a major stakeholder in it. Besides it, the only company providing bandwidth leasing services to ISP’s is Transworld Alliance ie TWA. This gives PTCL a whopping control over the whole telecom sector. It stifles competition and gives them absolute price setting power and ability to manipulate the market to their whim. Since the advent of mobile providers like Telenor, Warid and China Mobile, the market opened up to healthy competition bringing down the call rates that were quite exorbitant before the deregulation of the telecom sector in 2004. Before this, Mobilink was the sole provider of GSM services in Pakistan for almost 10 years since 1994/95. It virtually controlled the Pakistani market in the presence of providers like Paktel and Instaphone. The critical aspect to understand is the unlimited control that PTCL is exhibiting in the realm of internet services in Pakistan. A key indicator is the growing use of VOIPs and preference of cellphone usage in Pakistan. Due to low calling rates, the use of fixed line telephony services has reduced drastically in comparison to the ease of access offered by cellphones. This has hurt PTCL revenues sharply in the last decade since it was sold to Etisalat in 2005. Due to exploding growth of smartphones and widespread Wi-Fi internet access availability in the urban areas, the use of VOIP services like Skype, Viber has grown tremendously. Due to the ease of convenience that it offers and the biggest thing is, it are free! As per net neutrality, PTCL should be offering a level playing field to all competitors and not prioritize their fixed line services which is in effect; detrimental to the consumer. Due to exponential growth in VOIP services, PTCL has blocked the ability to make calls over Skype to landline numbers abroad which is a gross violation of the principles of net neutrality. Degradation in services like Skype and Viber which people use to contact their loved ones abroad causes significant hurdles for the consumers. It forces them to use fixed line or wireless telephony services to contact them instead. Alternatives do exist, but the majority using Skype or Viber like applications do not possess the knowledge or are tech savvy enough to determine which other services to use instead. Interestingly, another example of net neutrality could be a deal signed by PTCL with the Jang Group of Newspapers, who own the famous television channel Geo, and the English newspaper; The News. This would involve the Jang Group paying PTCL money to offer prioritized internet traffic to its news portals like Geo.tv and TheNews.com.pk during peak hour usage. For example in the evening when people come back home and log onto the web and access news websites. This could happen possibly that competing websites like ARY and Dunya news websites either would be very slow to access due to a deliberate slowdown in internet traffic by PTCL. This would force the consumers frustratingly to switch to websites like Geo which are readily, easily accessible due to the prioritized speeded up traffic being provided by the ISP. This ultimately would work to the benefit of PTCL, which would either hatch up a package offering speeded up internet access in form of a paid upgrade to the consumers, or offer tiered internet services depending on the level of usage of the customer. A customer or even a company in need of speedy internet access would hop onto this bandwagon and save themselves from the misery of slow internet access on websites that they want to access. This would mean more revenue and profits could be generated by PTCL and make it immune to competition. And hence it will not make significant investments in its infrastructure to provide better internet services to the customer. PTCL would know it well when they can rake in significant revenue by just hatching up prices and slowing down internet access deliberately. In a market totally dominated by them who would dare challenge them? Even the government due to the significant market share and fear of investor unrest would not take on the behemoth known as PTCL and would put its hand up. The mention about video streaming and IP TV access in respect of net neutrality was purposely ignored. Till now the level of streaming and data consumption in Pakistan is not comparable to the West; due to a lack of high speed internet access. With the advent of 3G and 4G services; whose licenses are being auctioned shortly; Net Neutrality will garner significant importance and the netizens of Pakistan will realize what lies ahead of us as the use of data services would grow exponentially in the coming few years. I was ceased to be amazed by the censorship policies of our telecom authority ie PTA. 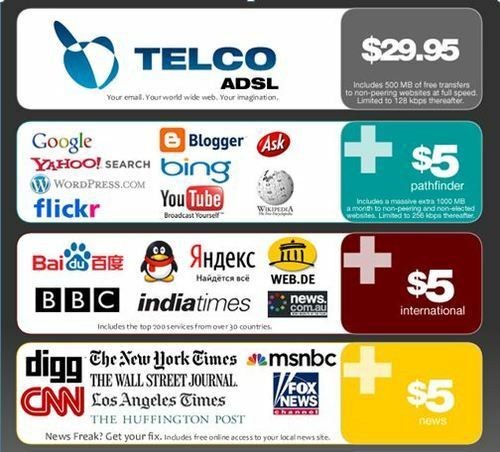 Three very well respected technology websites Gizmodo.com, Lifehacker.com and TheVerge.com were blocked by our ISP’s on the instructions of PTA. I was flabbergasted and overawed by the audacious and stupid ban put in place on these very good sources of information for technology related news and happenings. These websites as far I have known have never housed any disconcerting content that would give rise to it being deemed ‘harmful or inappropriate’. If the authorities feel that these websites mentioned above are responsible for hosting “objectionable” content; a reasonable explanation should suffice detailing every aspect of why these websites were blocked in the first place; and what kind of content did they deem was objectionable which led to the blockage or ban on these websites. Everything is under the radar of the state; massive surveillance and privacy violations are being conducted on a daily basis and rights to freedom of speech being curtailed on the internet. The blocking of websites is the first of many missteps that the state undertakes to block the right to access as basic a thing as information on the internet. The absence of any clear guidelines and policies and a sudden blocking of a website is not only erroneous but also practically stupid so to speak. The websites that are hosting transparent and harmless content in nature and are in no way offensive or harmful to the States very existence; why the hell is it blocked? Is there a legitimate reason to block these websites without any prior notification? Is there any mechanism under existence to ban or block these websites? Do any kind of legislations exist in the power of the state to empower the telecom authority to block any website at their whim without any practical reasoning? Are notifications issued to the ISP’s or an official press release made by the concerned stakeholders that a certain website or websites have been blocked due to this and this reason? In these circumstances; a pronounced absence of laws and guidelines for blocking websites is just mind boggling. One fine morning, we get up and see a website we view daily is blocked! Then the very next day it is ‘miraculously’ unblocked!! The formulation of polices and guidelines is an utmost necessity in this digital day and age; laws need to be enacted by Parliament and passed through so a proper mechanism is in place to facilitate the closure or blockage of these websites. On a personal level; I am not in favour of disbanding or blocking any websites and denying the netizens of the right to access information in any given way. Blockage ensues frustration at a level even for genuine purposes; like people doing research who have to view Youtube to view a specific video that is interlinked to their work and also for example upcoming musicians; startups etc who have to rely on free mediums to disseminate information about their specific ventures. Due to these blockages; various pedigrees of business and upcoming artists and talents that need the medium to showcase their talents are being curtailed; unnecessarily. The underlying frustration of those ‘genuine’ users is to circumvent these blockades and resort to using Virtual Private Networks or proxies to access these ‘banned’ websites. Absurd bans like these make no sense at all and have no valid reasoning and explanation. If for some apparent reason; the websites mentioned above are guilty of hosting content that the State finds ‘objectionable’ to its liking; it can take the step of simply blocking that particular URL and not blocking the whole DAMN WEBSITE! Emancipation of information is being curtailed by the State at every level and it is their prerogative to deprive the netizens of their basic rights to access it. Blocking and massive filtration of the internet will not stop the seeds of discontentment from sprouting up. Proactive policies need to be formulated in regards to the Internet in Pakistan; guidelines need to be developed and a framework promulgated to ‘Censor’ content if NEEDED! By blocking websites which emanate knowledge and add value in every respect of the word; it will only harm us in the longer run. The internet is also a great resource of learning; besides the ‘Objectionable’ content it also houses according to the said morals and virtues of our State. If the State encourages instead of discouraging the people to view the internet; it can help the populace to be empowered in every given way whether it is in the field of education; the economy and it will only add value and make them that much aware of the happenings in the world. The internet can galvanize a revolution of knowledge and learning in Pakistan; and with a massive chunk of the 180 million population under the age of 25, we have to encourage the use of the internet proactively. Bannistan is not the solution to our problems; it only aggravates them!